If there were two dirty words at the 2011 National Automobile Dealers Association convention in San Francisco this year, those expletives would be "stair steps." 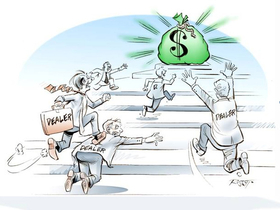 In stair-step incentives, manufacturers pay steadily increasing cash bonuses to dealers to meet a series of volume targets, typically as part of a monthly sales promotion. Dealers who hit the factory-set targets enjoy a price advantage over those who do not. To critics, they create a two-tier pricing system that confuses and alienates consumers. To proponents, they provide tempting cash incentives to move more metal. AutoNation CEO Mike Jackson set the tone at NADA, upbraiding manufacturers for the practice in a speech at the J.D. Power automotive conference before the convention. Jackson showed a cartoon -- called Stairway to Hell -- depicting dealers desperately climbing over each other in pursuit of a bag of money. "The sales targets are arbitrary," Jackson said. "Any manufacturer who preaches customer satisfaction and practices stair-step incentives is a hypocrite." Don Hicks, a multifranchise dealer in Aurora, Colo., and vice chairman of the Colorado Automobile Dealers Association, picked up the torch from Jackson in remarks to dealers at the CADA convention breakfast. "Stair steps are the most corrosive thing and the most anti-dealer mechanism the factories have ever come up with. Take a look at the financial statements and see how many dealers' new car departments are profitable and you'd be amazed. It [a stair-step program] distorts everything. As a franchised new vehicle dealer we should have the right to make a profit in our new car department ." And Stephen Wade, 2011 NADA chairman and a Utah multifranchise dealer, recounted his bad experience with a manufacturer's stair-step program during his convention-closing speech. "I had a friend and neighbor who needed to buy two trucks, someone I know and respected in our community. I realized he was struggling. I wanted to help him out and give him the best price I could. I shared my cost with him, offered him a price just a few hundred dollars over my cost." "Not long after the sale, he went to a dealership in a border state that was offering the same truck with a manufacturer's incentive that was $500 less than what I could offer him. He came to the dealership afterwards and said 'I didn't think you'd do that to me.' I wanted to do the best for my friend, and how does this make me look? All for $500." Stair-step programs have their boosters among dealers, but most were keeping their feelings to themselves at this convention. With some of the industry's top dealers calling loudly for an end to the practice, it's sure to remain a source of friction in the year ahead.